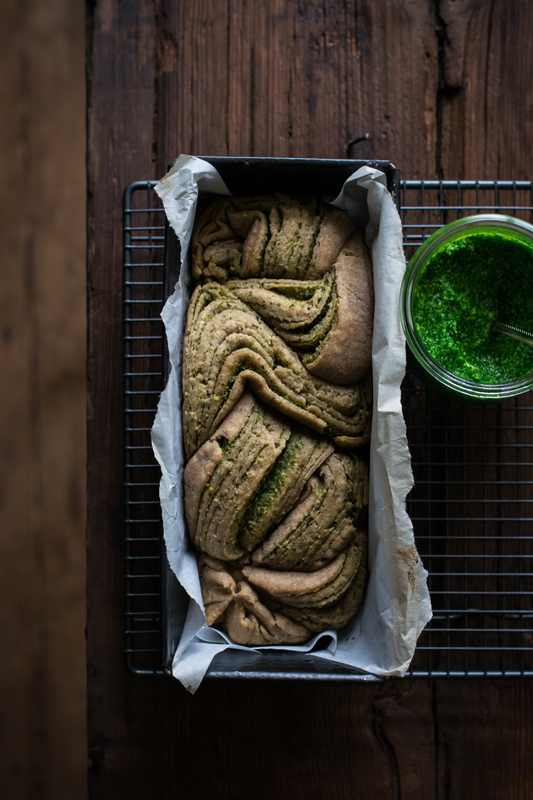 This goat cheese & ramp pesto babka bread is on point if you’re looking for an original and economical idea to impress your friends during a future dinner or aperitivo. 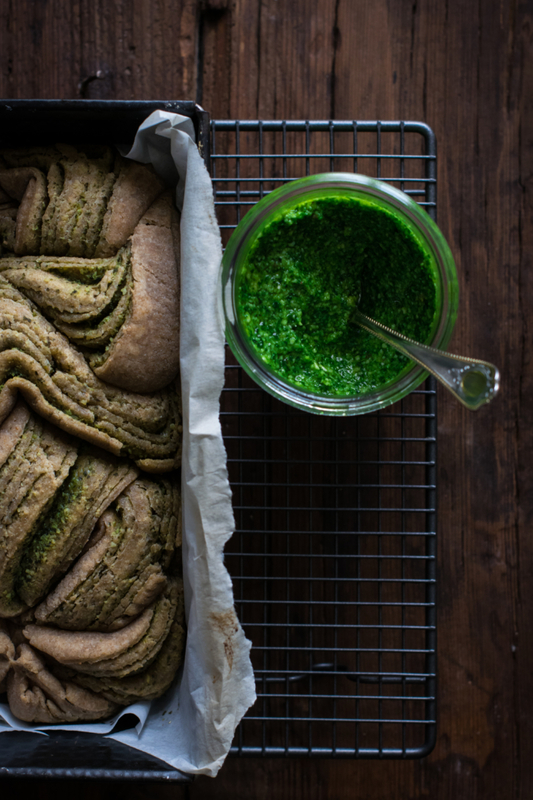 Even though the preparation for the homemade dough takes a bit longer, this pesto babka bread is incredibly easy to bake and you might even get enough goat cheese and ramp pesto for the next weeks. 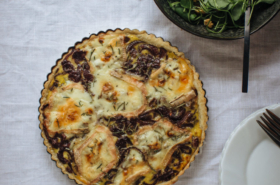 I actually started to make this recipe for dinners and pre-party snacks, when I have to prepare something on-the-go while being either too short of time or money at the end of the month. Its singular shape + happy color always succeed to catch people’s attention and convince them that it takes hours to prepare. Okay, that’s the case for this one as the dough needs to rest overnight. BUT: if you’re way too lazy or impatient for that, then you can just buy some ready-to-use pizza dough and follow the same steps – including letting 1h rest at warm temperature! 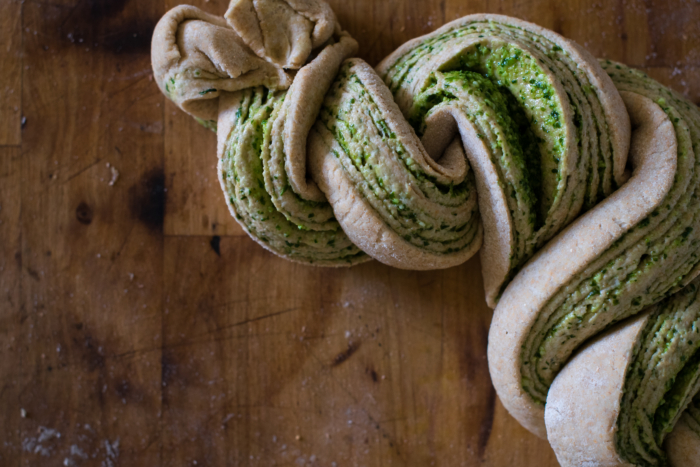 Spread, roll, braid, and you’re done! While opting for a homemade babka dough, I actually wanted to make it with whole flour in order to enhance the “rustic” aspect of the recipe – as well as making it a tiny bit healthier, then you can balance with more booze without shame lol. 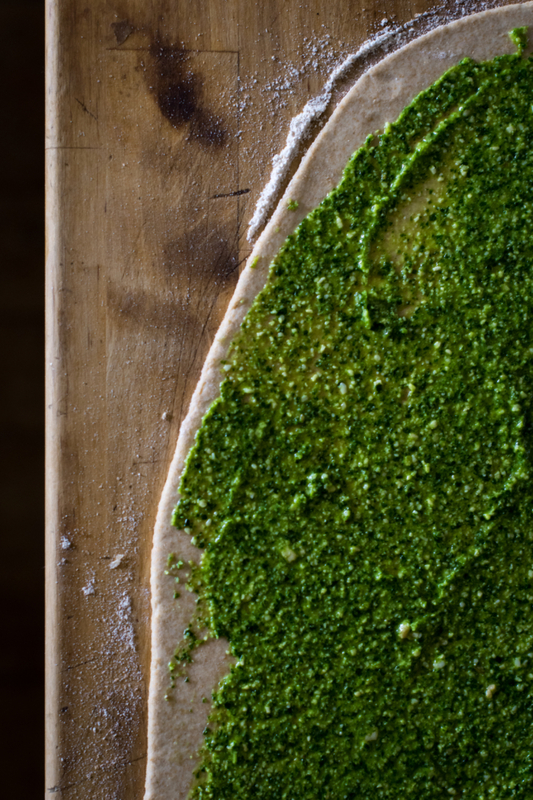 The texture tends to be a bit different then: while you might get a airy and souple texture with a classic white flour pizza dough, this whole version will give a texture that is rather close to soft bread. 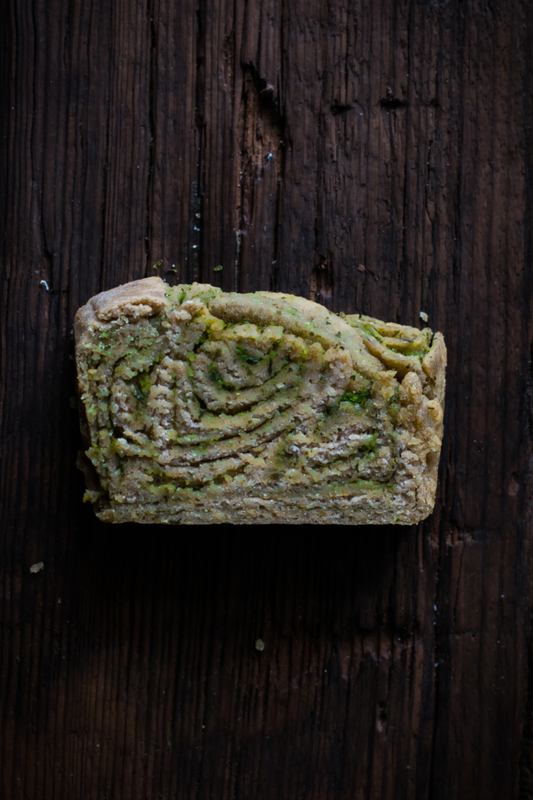 About the goat cheese and ramp pesto, choose a very flavourful and tender goat tomme cheese. 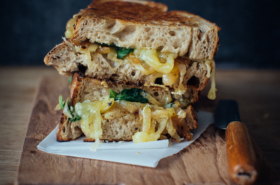 Its flavours won’t be so strong when making the pesto, but it’s amazing after a little rest and you can clearly feel the sour and sparkling touch brought by the cheese. 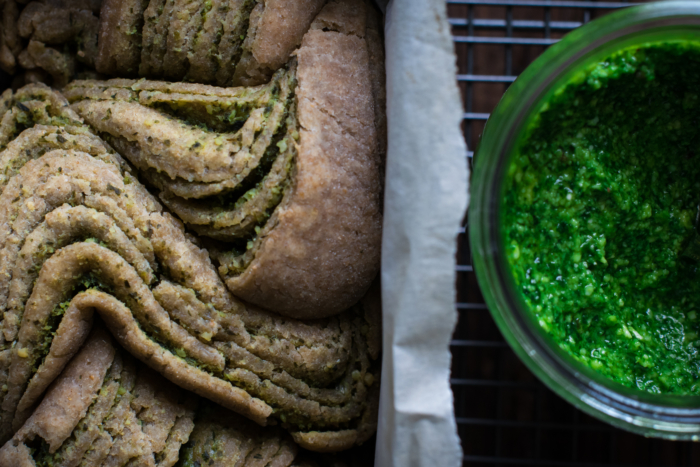 When not in baked goodies, I’m used to eat this pesto with pasta or salads to enhance their taste. 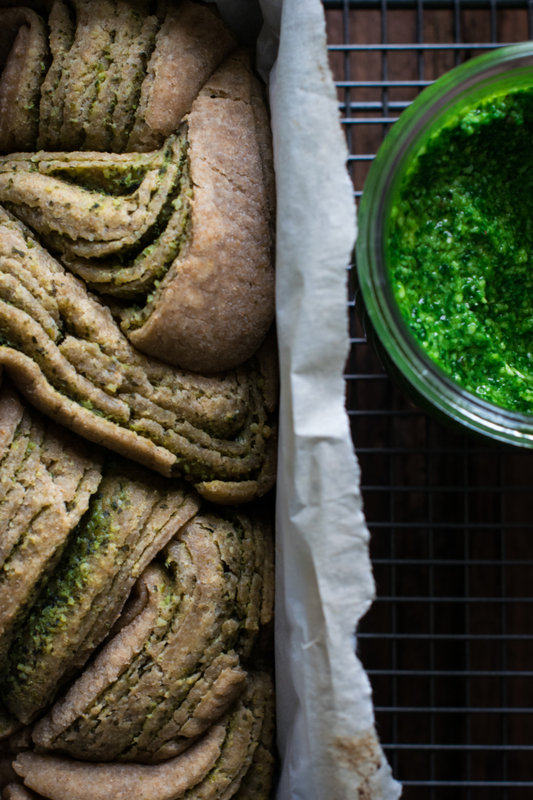 In case if you would like to get a goat cheese & ramp pesto babka bread even richer, feel free to add some pieces of ham or charcuterie on the dough during the spreading step! 1. 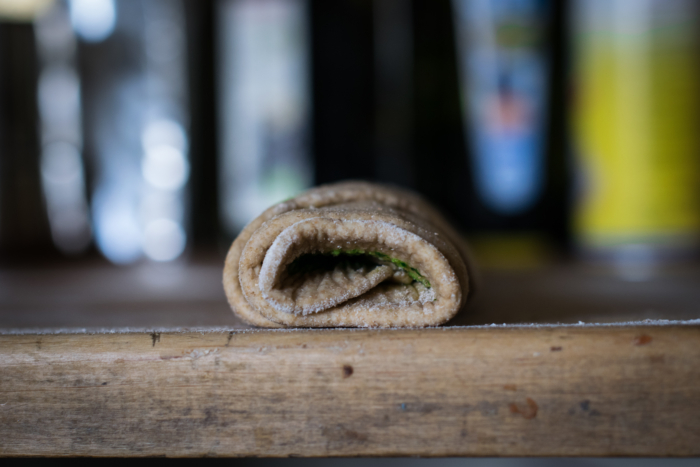 Prepare the babka dough: in a salad bowl, mix whole wheat flour, salt and yeast. Add olive oil, active starter and lukewarm water and knead with a kneading machine or with your hands for about 5-10 minutes. 2. Shape a ball of dough, brush it with olive oil and let rise for a few hours - ideally overnight - in a covered bowl at room temperature..
3. 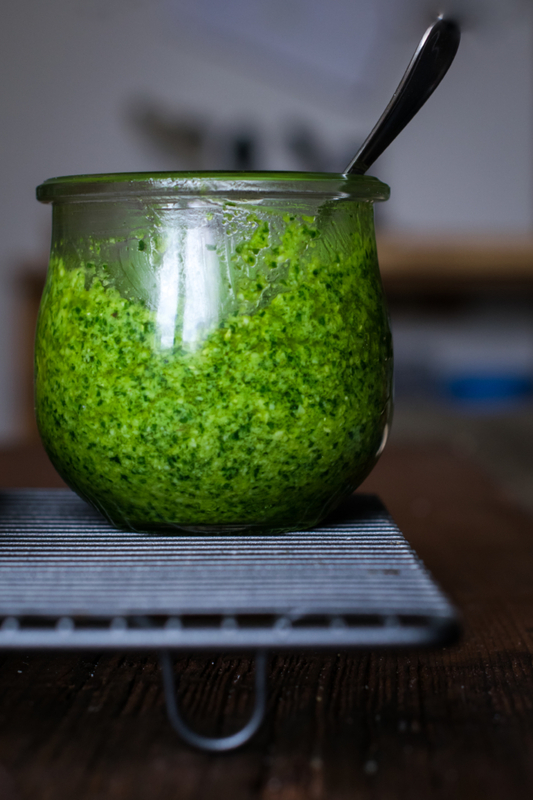 Prepare the goat cheese & ramp pesto: add ramp in a food processor and mix until homogeneous. 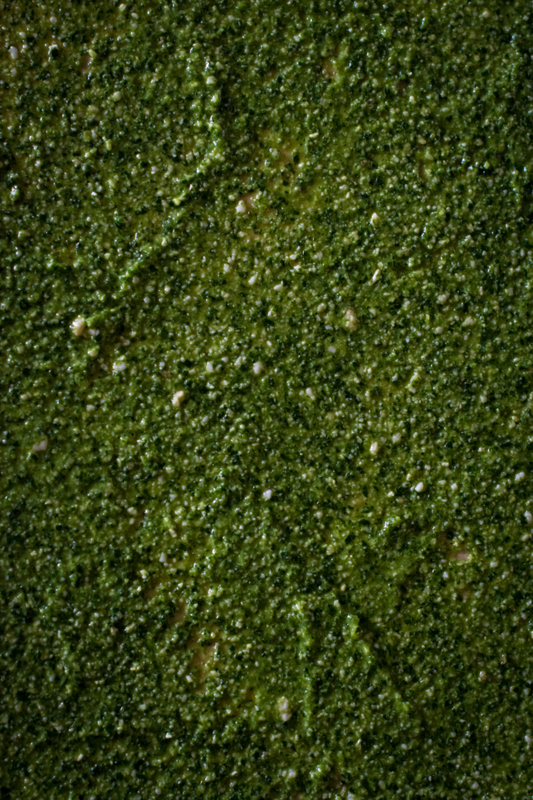 While food processor still running, add salt, pine nuts, goat tomme and parmesan cheese to the pesto. Then pour olive oil in dash and keep mixing until you have a homogeneous ramp pesto. 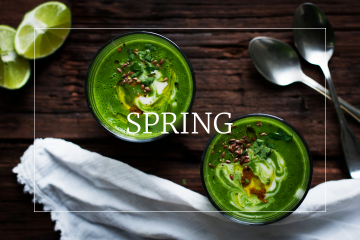 Pour in a air-tigh container and keep in fridge for a few weeks. 4. When the babka dough has doubled in size, punch it to release the air, then knead again on a floured surface. 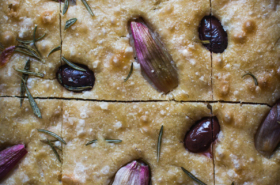 Spread the dough and shape it in a 50x30cm rectangle, ±5mm thick. 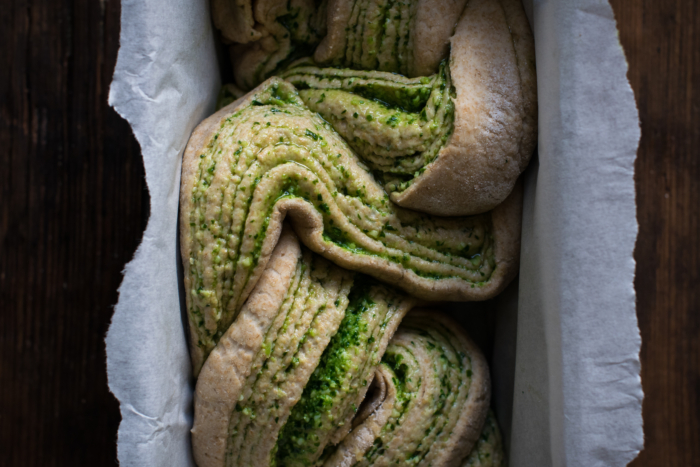 Spread some goat cheese and ramp pesto on it, then roll the dough lengthwise. 5. 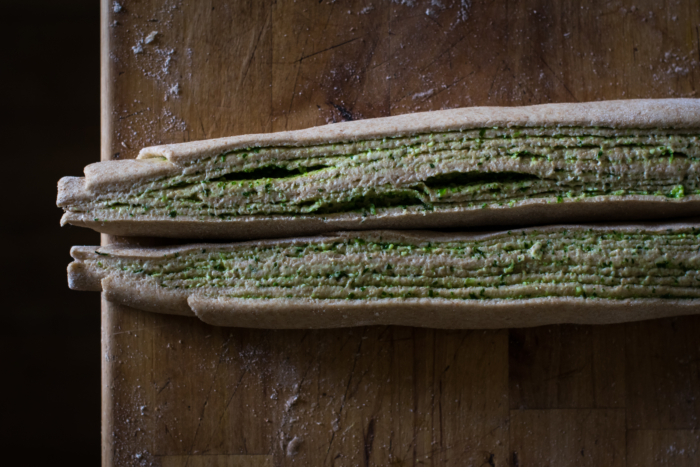 With a good knife, cut lengthwise the roll in 2 equal snakes. Turn each of them in order to have the inside toward the sky, then fix together the upper extremities. 6. Preheat oven to 50C. 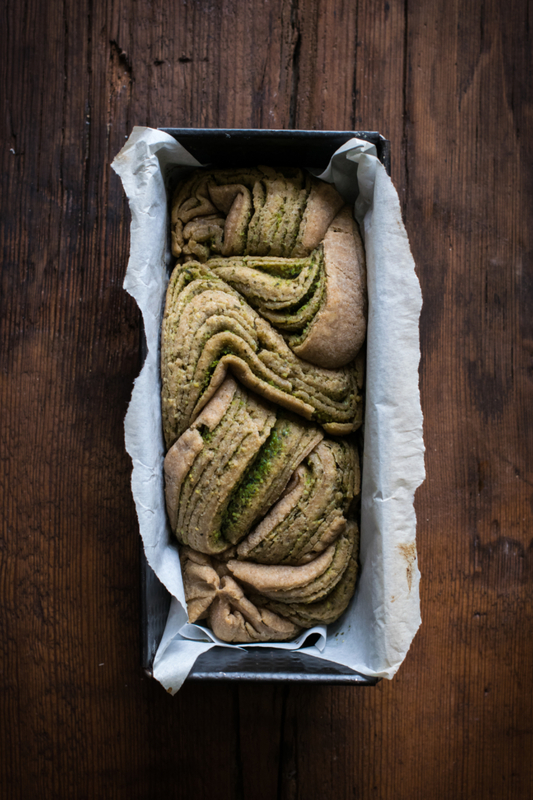 Transfer gently the goat cheese & ramp pesto babka bread to a greased and floured cake mould, cover, then let raise in warm oven for one more hour. 7. Preheat oven to 180C. With a brush, spread some extra olive oil on babka dough, then put in oven for about 30 minutes. The babka loaf is ready when it gets a nice golden color. Serve warm or cold as side dish or appetizer.